Telenor Norway registered an average download speed of 72 Mbps in Q2 2018 according to measurement service Ookla. In a blog post Ookla, which has Telenor as an enterprise client, was able to shed some light on how such speeds are achieved. There doesn’t seem to be anything too surprising; carrier aggregation , 256QAM, 4×4 MIMO and all that jazz all add up to a nice lot of bandwidth. On top of that it seems to have largely shifted voice traffic over to LTE, which presumably frees up more spectrum to widen the 4G pipe. As a consequence Ookla has Norway in second place in its global wireless speed rankings, although its average speed of 57 Mbps indicates the other Norwegian operators are way behind Telenor and need to introduce some QAM and MIMO into their diets. 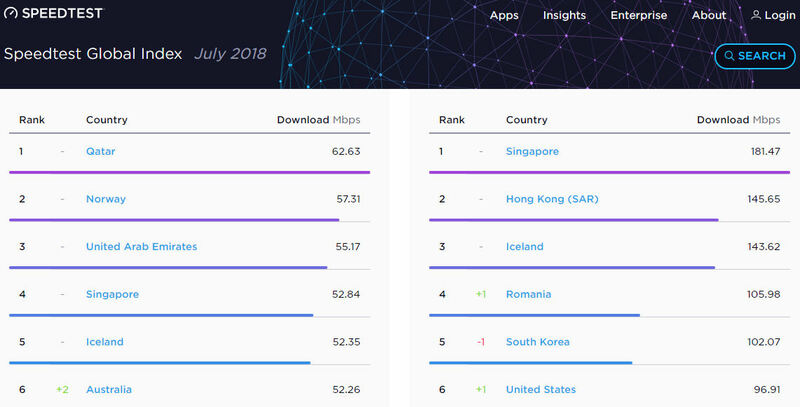 Qatar is the clear number one and UAE is third, indicating the Gulf has been investing heavily on infrastructure, while Singapore and Iceland are in the top five for both mobile and fixed speed. The UK is 51st on mobile and 30th on fixed.